While many patients don’t immediately consider visiting the dentist after a sleep apnea diagnosis, Drs. Douglas Campbell and David Schmidt have training and experience treating sleep apnea using custom oral appliances in our Lake Forest, IL dental office. 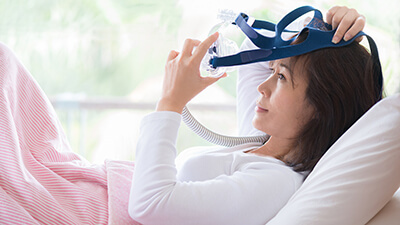 These treatments may be preferable to other more invasive solutions like CPAP therapy, which many patients find themselves unable to adjust to. Additionally, oral appliance therapy is also an effective treatment for patients who suffer from chronic snoring. Contact our team to find out more or schedule a sleep apnea consultation. 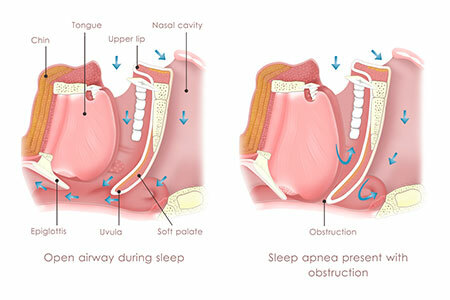 Obstructive Sleep Apnea (OSA) occurs when the tongue and soft palate collapse onto the back of the throat. This blocks the upper airway, causing air flow to stop. When the oxygen level drops low enough, the brain moves out of deep sleep and the individual partially awakens. The airway then contracts and opens, causing the obstruction in the throat to clear. The flow of air starts again, usually with a loud gasp. When the air flow starts again, patients then move back into a deep sleep. The airway muscles collapse, as patients awaken with a gasp. The airway clears once again as the process repeats itself. This scenario may occur many times during the night. The combination of low oxygen levels and fragmented sleep are the major contributors to most of the ill effects that the sleep apnea patient suffers. In addition to excessive daytime sleepiness, studies show that sleep apnea patients are much more likely to suffer from heart problems (heart attack, congestive heart failure, hypertension), strokes, as well as having a higher incidence of work related and driving related accidents. How do you know if you have Obstructive Sleep Apnea (OSA)? Start by taking our simple test but be sure to visit your physician if you think you have a problem. Since OSA is a serious medical condition, it must be diagnosed by a physician. Diagnosis is based on the results of an overnight sleep study, called a Polysomnogram (PSG). 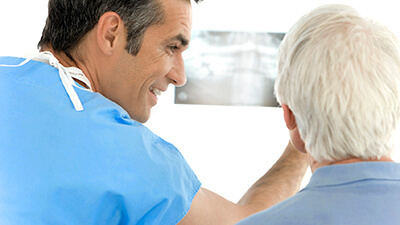 Other factors in determining OSA diagnosis are a patient evaluation and thorough medical history. Good sleep hygiene, weight loss, and exercise are some helpful OSA treatments a patient can practice on their own. However, medical and dental treatments include continuous positive airway pressure (CPAP), oral appliance therapy, combined CPAP and oral appliance therapy, and/or surgery. What is Continuous Positive Airway Pressure (CPAP)?? Continuous positive airway pressure (CPAP) is pressurized air generated from a bedside machine. The air is delivered through a tube, connected to a mask, covering the nose. The force of the pressurized air splints the airway open. The CPAP opens the airway like air into a balloon. When air is blown into the balloon, it opens and gets wider. This is exactly how CPAP clears the airway. Oral appliances are worn in the mouth to treat snoring and OSA. These devices are similar to orthodontic retainers or sports mouthguards. Oral appliance therapy involves the selection, design, fitting, and use of a custom designed oral appliance that is worn during sleep. This appliance then attempts to maintain an opened, unobstructed airway. There are many different oral appliances available. Approximately 40 appliances have been approved through the FDA for treatment of snoring and Sleep Apnea. Oral appliances may be used alone or in combination with other means of treating OSA. These may include general health, weight management, surgery, or CPAP therapy. Drs. Campbell and Schmidt have extensive training in oral appliance therapy, and they are familiar with the various designs of appliances. They can determine which one is best suited for your specific needs. They work with your physician as part of the medical team in your diagnosis, treatment, and on-going care. 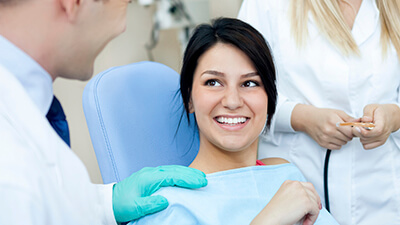 Determination of proper therapy can only be made by joint consultation of your dentist and physician. Initiation of oral appliance therapy can take several weeks or months to complete. Your Lake Forest sleep apnea dentists will continue to monitor your treatment and evaluate the response of your teeth and jaws, during this time.